Photo via West Edmonton Local on Flickr. The Edmonton Police have responded to the fact that 69% of pedestrian/car collisions are the fault of the drivers by... going after the pedestrians. Classic Ignoring the Bull tactics in a car-centric city. Not only are they condescending to pedestrians, they are continue the unfortunate tradition of treating people like sheep by herding them into pre-determined migration paths that protect the automobiles from disturbances that may result, shock horror, in the need to slow down and be aware. 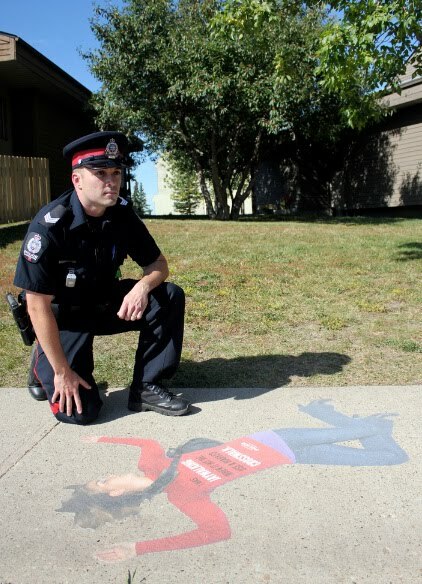 The campaign features outdated shock tactics using stickers on the sidewalk of young people... um... having a nap. There is more about the Edmonton campaign here. The concept of "Jaywalking" was an invention of the automobile industry in early decades of the last century during a comprehensive and lengthy campaign to brand streets as exclusive space for automobiles. A campaign started to counter the massive societal revolt against automobiles. We've covered it in previous posts about The Anti-Automobile Age. The Edmonton Police should cut to the chase and get a sponsorship from local car dealerships. They could add a Ford or Chevy logo to their uniform and use the sponsorship fees to pay for their Christmas party. If there are places where "jaywalking" occurs regularly, it is probably time for the city planners to redesign and to listen carefully to the Desire Lines of their citizens. And perhaps police forces everywhere should stick to law enforcement and leave marketing and behavioural campaigns to people who know what they're doing.